This was the first night of the August Bank Holiday weekend Welsh Groundhop, a marathon of an event that takes in 11 grounds in four days. I was doing a very curtailed version of Llanfair United on the Friday night, followed by the Morning game at Penybont and then off-hop to a higher level of ground, at Rhayader Town, in the Cymru Alliance. The rain was unrelenting as I drove down the A53 to Shrewsbury, then on to the A458 to Welshpool. The grey friday wasn’t letting up as I made the final leg, west of Welshpool to the little town of Llanfair Caereinion, terminus to the Llanfair and Welshpool Light Railway and, more importantly, the Spar Mid Wales League Division Two side, Llanfair United. 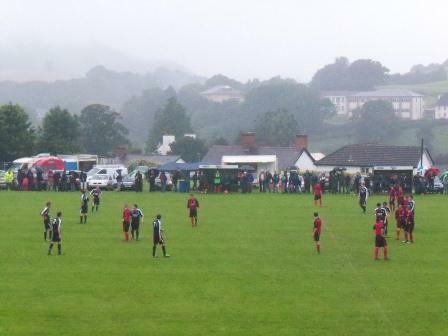 If it wasn’t for the Groundhop, the rain would surely have postponed this tie, along with many others on the following days in mid Wales. I arrived at the ground with time to spare, the rain still bucketing down unceasingly on an already heavy pitch. Early arrivers were sheltered under canopies eating hot food, drinking coffee and scrutinising the merchandise on offer. Around 200 hoppers were in the area, reducing the average mental well-being of the little welsh town. A pleasant pint in the Black Lion was consumed before the game, in the company of the Llanfair manager and a few of their players. The Mount Field is right in the centre of the town, off the main road, so it was only a minute’s walk up from the pub in the town centre. 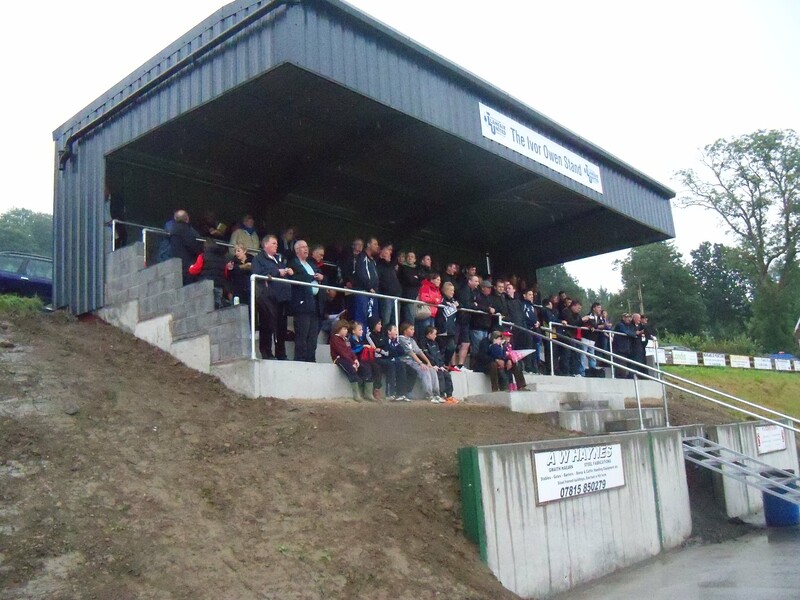 Llanfair’s brand new stand was to be officially unveiled before kick off. As kick off approached and the stand was starting to fill with hoppers, a bloke with a pole scrambled about round the back and pulled off the cloth to reveal the Ivor Owen Stand. A smattering of applause accompanied the pitter patter of rain, as proud officials tramped off in puddles and mud. 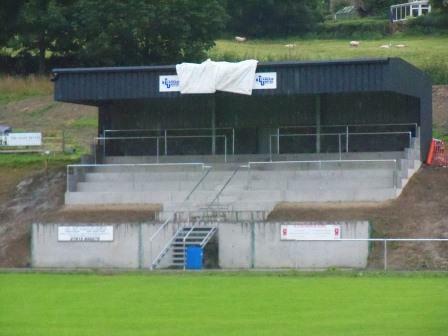 Llanfair United’s new stand shows their ambition to climb up the Welsh pyramid. In 2010-11 they were promoted from the Montgomeryshire Amateur League and are favourites for promotion up to step three and the Mid Wales Division One. I think plans are in place for floodlights in the near future. 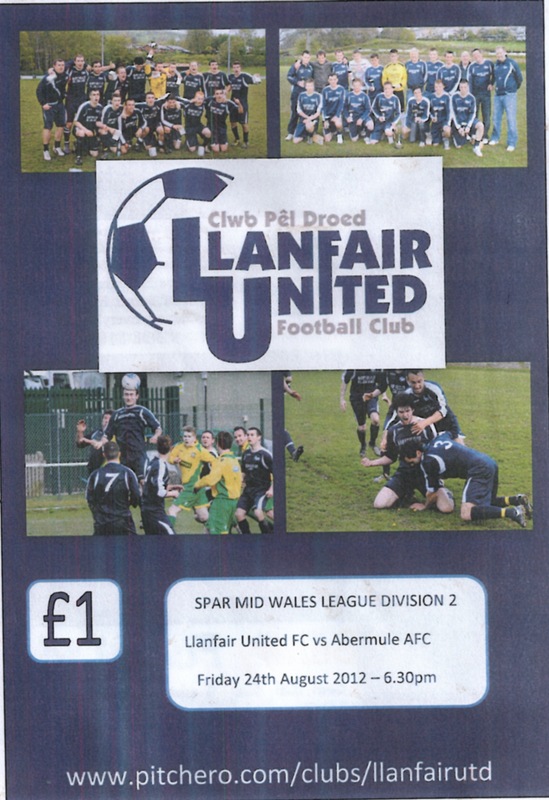 The bumper crowd was witness to an entertaining game as Llanfair raced into an early 2-0 lead. A drubbing looked on the cards, until Abermule got an unlikely goal; a goalkeeper’s clearance rebounded off an Abermule backside and in. 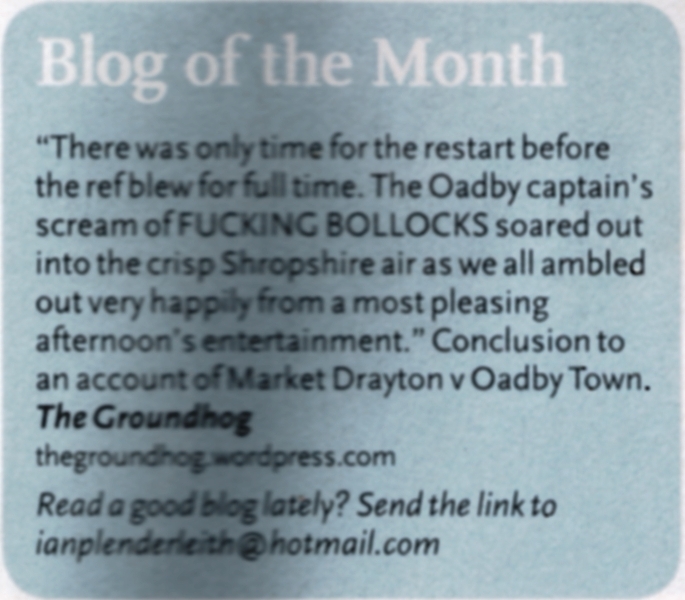 Inspired by their unexpected fortune Abermule had plenty of chances to equalise, one of which panged back off the post. Missed chances proved costly as Llanfair went on to score another two and progress toward promotion. 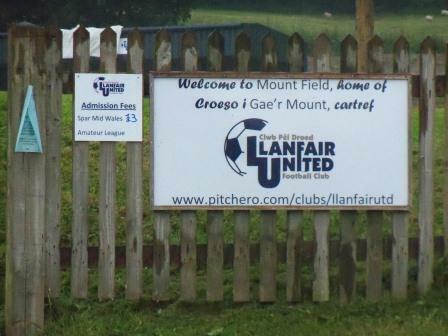 This entry was posted in Groundhopping, Travelog, Welsh football and tagged Abermule, Llanfair Caereinion, Llanfair United, Mount Field, Welsh football. Bookmark the permalink. Mmm. Looks a bit grim, that one! Yeah, you’re not wrong! Trouble with these hops is that they’re always in such low leagues. Weather didn’t help, of course.